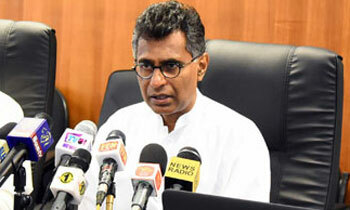 There is no risk of explosions caused by methane gas in the Meethotamulla garbage dump, Megapolis and Western Development Minister Patali Champika Ranawaka assured today. Last week, the Japanese research experts warned of a methane gas explosion in the dump. However, the minister categorically denied reports saying there was not enough methane level to cause such explosions. Addressing a news briefing held at the Ministry to make people aware of the measures which are being taken to rehabilitate the Meethotamulla garbage dump, he said a 12 point action plan is in place to rehabilitate it. “The action plan which includes 12 short term measures to stabilize the base of the dump will be completed within next five months. Three committees; expert, engineering and operations; are implementing the action plan. We must get ready for upcoming rains in May as it might make an impact on the dump,” he said. Meanwhile, the minister said it was reported during a meeting chaired by President Maithripala Sirisena on Wednesday that there are many other excessive garbage dumps across the country which would become a danger. “There are two massive garbage dumps in Kandy, one in Guhagoda and another in Gampola. They may not be of the same magnitude of Meethotamulla but they are also on the verge of becoming a threat especially polluting Mahaweli River and Polgolla Reservoir. It was also reported that there are garbage dumps in Galle, Matara, Kalutara and Gampaha which need attention,” the minister said. He said Local Government and Provincial Council Ministry will instruct local government bodies to minimize risks of garbage dumps and experts committees of the Megapolis Ministry will educate them how to take further measures. Further clarifying on the subject, Moratuwa University’s senior lecturer Dr. Mahesh Jayaweera said the combustible level for methane to cause explosions was 5% but the methane levels in the dump were less than 2%. “There is no risk of methane explosions but high risk of fire break-out remains due to the high levels of Carbon Monoxide (CO) levels at certain places in the dump. We are taking measures to address this issue,” he said. He said main objectives of the short term plans within the next five months are to control further collapses and stabilization of the dump site. Once the dump base was stabilized, the height of the dump would be reduced to 20 metres from present 48 metres to avoid further collapses, he said. Research Scientist Manjula Gunawardane, who explained about the physical properties of the dump, said about 1 million cubic metres of garbage were in the Meethotamulla garbage dump. We see nothing happening in your Dept. Only a BUS lane has come to effect for last two years. This is the sad truth. Who's words willing to take by the people? Ministers or Japanese experts words? Dear Champkia, please stick your neck deep in to the garbage dump and you will see the required level of methane to explode. These ministers are notorious for saying that nothing will happen until irreparable damage is done.